We offer excellent tracks for extreme terrain performance. The exclusive Shape Changing Suspension (SCS). 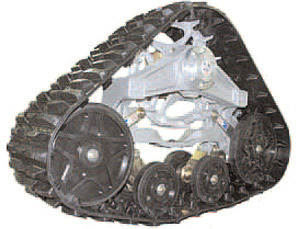 This adjustable suspension allows for a larger or smaller footprint, changing the approach angle of the leading edge of the tracks for better “lift” in softer conditions. Suspension automatically adjusts approach and departure angle when encountering obstacles, without effectively changing track tension. Assembly Weight . . . . . . . . . . . . . . . . . . . . approx. 370 lbs @ 92 ea. Recommended Max Gross Wt. . . . . . . . . . . . 2,500 lbs. (Hard Surface) . . . . . . . . . . . . . . . . . . . . . . 24” Min. (Soft Surface) . . . . . . . . . . . . . . . . . . . . . . 36” Max. Ground Contact Surface Area (approx.) . . . . 1056 Sq.” Min. *Depending on vehicle, cargo, and accessories. 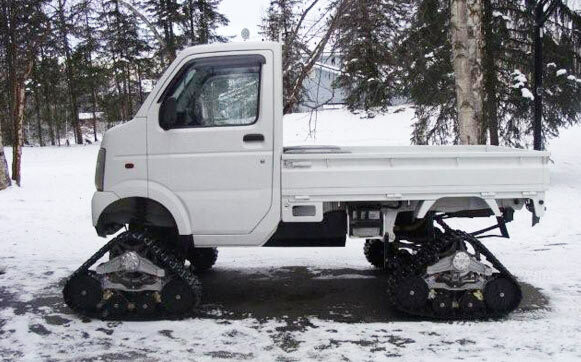 **For maximum tread life ***Some vehicles may require slight alterations.